One simple word - sew - but it contains a whole world and many lifetimes of projects. Large, small, simple or mind-boggling complex. Practical or fanciful, for yourself or for others. Each project may take a few minutes or hours or days/weeks/months/years. It's a very handy skill to have or learn. And no matter how long you've been sewing, there is always more to learn! And an unending variety of ideas. Than add knitting - same thing. So much fun. I don't remember learning to sew, though I likely did get some beginning instruction. My mother sewed (a lot! ), my older sisters sewed, as teenagers most of my girl friends sewed, as well as some of the boys. We had a class in sewing at some point in school, though I don't remember learning much there. I think much of my, and my friends, learning was by experience. You found a pattern, got some fabric, sewed up whatever, then did whatever you could to make it fit. Since my Mom sewed so much, and was certainly faster and a better seamstress than I was, I didn't make much until after I left home. I must have gotten my first sewing machine, a basic Kenmore, for a graduation or wedding present. It lasted for many years and sewed a lot of things it likely wasn't made for. When Steve and I moved north to our homestead in the late '70's my sewing skills were honed on a lot of mending and odd jobs that hardly ever included patterns or new fabric. Steve can sew as well and he made use of that hard working machine. It plain wore out at some point and we went on to a used, old, sturdy, basic Singer. It was more suited to the projects we asked of it, such as making a fur-trade era canvas tent. I didn't do much fine work in those years. But that old Singer did finally get to the end of its life and after struggling to sew things like high-tech Sil-Nylon backpacking tent and light-weight clothing on this old machine it was retired and we went to the sewing machine guru in Escanaba (Tebear's) and bought a brand new low end but adequate basic Viking-Husqvarna Emerald 116 sewing machine. Oh my, was that ever the cat's pajamas! Compared to my previous machines this was truly a gem. It sews anything from canvas to lycra and does as good a job as the person sewing can do. It fits our needs just fine without being complicated. 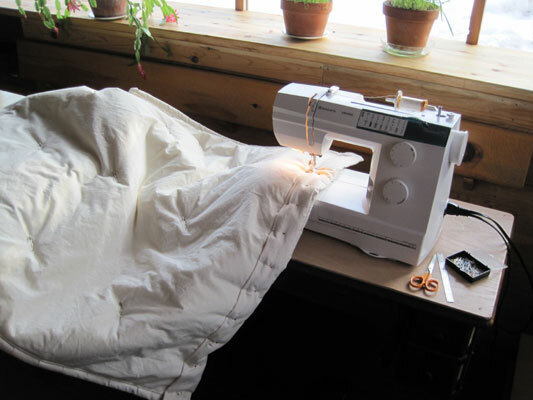 Sewing projects on the homestead are really varied, from mending to altering to making clothes, to odds and ends like kayak spray skirts, boat covers, camping gear. I certainly don't pretend to be a fine seamstress but I do appreciate having, and expanding, the skills to make what I want to make, alter what I want to alter, and create what is in my mind. I'll share a few projects as they come along (see left menu above), and various hints and ideas that have been useful to me. Hopefully you'll glean some ideas and inspirations for your own creative journeys into sewing. Have you read "Frost Dancing - Tips from a Northern Gardener"? A fun short read.